Available either with silver top and base plates or wholly in black, the Fujifilm X20 is as much of a joy to behold as its predecessor - the Fujifilm X10. It still looks like it's beamed in from a 1960s Cold War thriller, and some clever bugger has subtly slapped a screen on the back. Roughly the size of the Leica X2, and with a similar array of rangefinder-like knobs and dials in much the same places, we actually -incredibly - prefer the look of the Fuji. The X20's classic styling makes even Leica at three times the price seem plain. Like the X2, the X20's lens cannot be swapped, though without handling it you'd swear it was an interchangeable lens model, such is the attention to detail and professional air. While the design ethos and 4x optical zoom has been retained from the X10, it adds a new 12-megapixel 2/3-inch X-Trans CMOS II sensor, EXR processor and Advanced Optical Viewfinder provided for eye-level shooting which synchs up with lens movements. This has moved its maker to promise a substantially improved performance. Maximum lens aperture at 28mm equivalent wide-angle setting is a bright/fast f/2, and at maximum zoom (112mm in 35mm terms) still f/2.8. So, despite its lens not being quite as bright as the f/1.4 or f/1.8 maximum apertures offered by a handful of high-end compact rivals, this is conceivably an able tool for flash-free low light shooting. As back up, a small manually raised flash is also sunk into the X20's top plate. 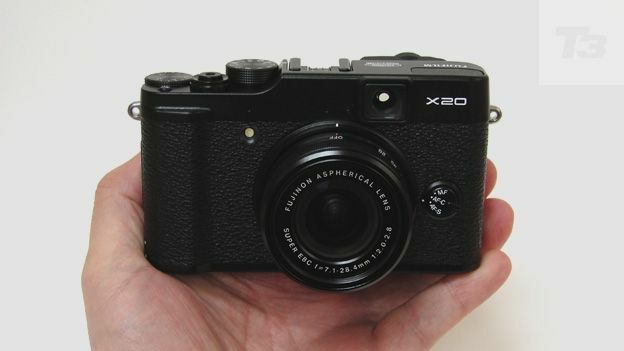 Aside from its Leica rival, which has the advantage of bigger APS-C sensor, the X20's competitors in terms of build, handling and performance include the Sony Cyber-shot DSC-RX100, one of the very best high-end compacts at around £500 for 20MP from a one-inch sensor, plus the Samsung EX2F, the Olympus XZ-2, the Pentax MX-1, and if you've got deep pockets then potentially also the Nikon Coolpix A, 16MP from a larger still APS-C chip (as with the Leica X2) for £999. In comparison with the above the X20's 12 megapixels from a sensor two-thirds-of-an-inch in size reads as modest, and will have the doubters wondering if this is a case of style over substance. The button and dial-festooned layout and smaller form factor make the X20 a great vehicle for shoot-from-the-hip street photography, being less intrusive than a DSLR. The provision of a zoom rather than a static lens with a fixed focal length also has its advantages in terms of altering your framing without having to step forward or back. Quirkily, there is no on/off button on the X20; the lens is simply rotated to the left/anti clockwise - and in the process extended proud of the body - to power it up. At this point you're automatically ready to take the first shot, so this rather unusual process actually becomes a time saver, as on the recent Nikon 1 J3 CSC with 10-30mm kit lens. Rotate the lens clockwise, in the process 'shrinking' it, to power the camera down. Rather than the X20's top plate dials being for aperture and shutter speed, as on the Leica X2, on this Fuji we're provided with the more conventional shooting mode wheel. This offers 11 auto and manual options, with the second dial being for manually altering exposure via incremental settings between -/+ 2EV. What we're missing at first glance is a button for accessing ISO speeds (here ISO100-12800), though a small unobtrusive Function button set just to the right of the raised shutter release button can serve this purpose. Alternatively the same button can be re-set/customised to instead provide one-push access to image size, image quality, dynamic range boost, film simulation modes, focus modes or to switch to shooting in Raw file format rather than standard JPEG - the choice is yours. In other words, there are plenty of manual options here alongside the purely automatic, and those who do want to experiment with them rather than just pointing and shooting will come away with the best results. Rather niftily, the X20 comes with both a regular, but actually quite incredible, optical viewfinder - in that the likes of shooting mode and aperture values are subtly projected within your line of vision thanks to something called a 'Digital Trans Panel' overlay - plus a 4:3 aspect ratio LCD screen just beneath. An eye sensor positioned by the smaller viewfinder detects when the camera is being used in this manner and automatically switches the main LCD off to conserve power. Remove an eye from the viewfinder and the larger rear screen automatically flicks back into life. It's a neat trick we're more used to seeing on DSLRs than compact cameras, and here all the more welcome for it. As for the LCD itself, though perfectly adequate it has been said that this is one of the slightly less impressive elements of the camera. It's so-so by current standards 2.8-inches in size and offers a resolution of 460k dots, when many in the premium compact field are offering a DSLR-like 921k dots. While not a deal breaker, there is room for future improvement here. It's also worth mentioning that the reassuring weight and metal build of this camera have the knock on effect of it needing to be gripped by both hands when using it. Again, while it has many pluses, it's not really the ideal camera for casual snapshots. The Fujifilm X20 comes with a NP-50 rechargeable lithium ion battery the size of an after dinner mint that slots into a compartment shared with all varieties of SD media at the base. It's charged with the aid of a mains charger and plug combo that does away with the usual trailing cable. Power is good for around 270 shots from a full charge, which while not super impressive is commensurate with this class of camera. Even if your shooting style is decidely amateur, using the professional feel X20 will have you imagining you're 60s era David Bailey. It's not all retro cool though. Rushing headlong into 2013, the camera offers a maximum video resolution of 1920x1080 pixels at up to 60fps and with stereo sound capture, too. Naturally as the lens is adjusted by hand, there is the ability to use the entire available focal range during recording. In video mode - accessed via a twist of the shooting mode dial - the LCD doesn't automatically switch off if you move your eye to the optical viewfinder. This is because the main screen provides a more accurate impression of what's being recorded, as it presents the shot in 16:9 widescreen format. By contrast the format of the smaller optical viewfinder obviously remains un-altered, as its physical size is fixed. We were lucky enough to be testing the X20 in sunny outdoor conditions, as well as naturally lit interiors. In terms of still image quality, at its worst some of the X20's shots can look like they were taken on a £200 snapper, with occasional over or underexposure when left to its own devices. And if you opt to boost the dynamic range manually then results can have a washed out quality if you're not careful. As other critics have remarked, the inclusion of a built-in neutral density filter beloved by landscape photographers as it helps maintains both shadow and highlight detail in the same frame might have been a bright idea (if you'll forgive the pun). At other times though - when youíve got favourable conditions and have determined the correct exposure for yourself - the degree of detail obtainable almost fooled us into believing we'd been shooting with a full-size DSLR. A bit of a mixed bag then for image quality, which loses it that potential fifth star in our eyes. You can get good results, but you have to watch what the camera is doing rather than just pointing and hoping. The gorgeously classic 12 megapixel Fujifilm X20 - like the rest of the premium X series - is a camera that has personality. It's not purely functional - indeed it's downright quirky in places - but the X20 is a camera that stands out in a sea of grey clones and we love it for that. Like its predecessor, the X20 will appeal to anyone who has ever lusted after the build quality and handling of a Leica but could never justify buying one. Well now you can. Just ignore your inner snob over the fact it's got Fuji branding and enjoy. Incidentally, if you're prepared to sacrifice the X20's rock solid build and viewfinder for an even more portable form factor then Fuji's XF1 released just before last Christmas - again 12MP, 2/3-inch sensor and 4x zoom, but for around £399 - is well worth checking out too. Only slight inconsistencies when shooting JPEG and leaving the camera to its own devices prevent us from awarding the X20 that coveted fifth star.